Katalina Deaven is marketing specialist at the Center for Media Engagement. Sometimes, a news organisation posts a story and suddenly the comment section becomes a battleground. 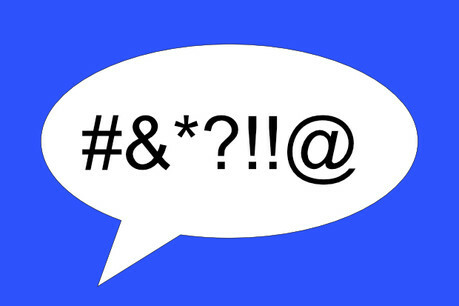 Profanity, name-calling, and yelling in ALL CAPS can dominate the discussion and pull focus from thoughtful dialogue. But what do these comments mean for your news brand as a whole? It likely has more impact than you think. 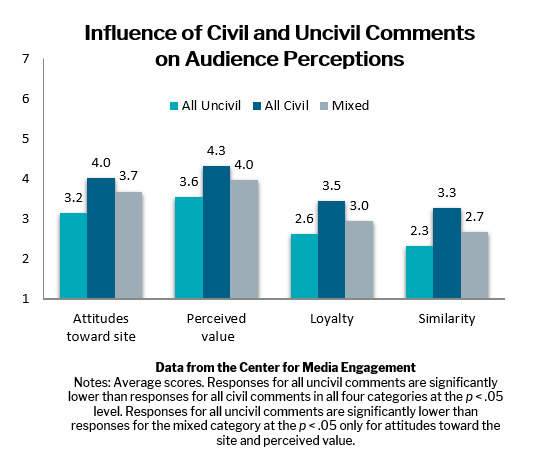 The Center for Media Engagement (CME) set out to test the effects of uncivil comments on the perception of the entire news site, not just the individual story. Researchers also wanted to find out whether readers make their evaluation based on the first few comments they see or based on the overall tone of the stream. 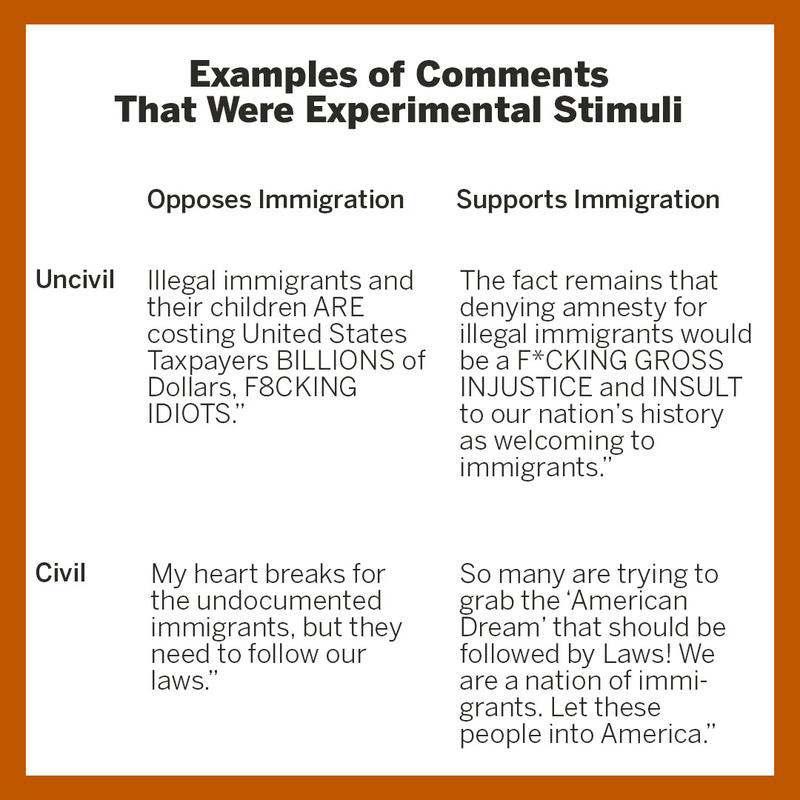 To find the answers, they conducted two online experiments that exposed readers to differing amounts of incivility in a news story comment section. Each reader was presented with comments that reflected both sides of an issue, so it was clear they were reacting to the tone of the comments and not the political stance. The research found that uncivil comments taint the perception of your news site as a whole. Readers can handle a little incivility, but if it is dominating the stream, it will affect the way they see your brand. CME researchers took into account several factors of perception. The study found that people who were only exposed to negative comments had less positive attitudes towards the site, were less likely to perceive the site as valuable, were less likely to report a sense of loyalty to the site, and were also less likely to feel similar to other commenters. Another notable finding is that it did not matter in what order the comments appeared. Seeing civil comments first did not improve the way readers viewed the site if uncivil comments dominated the stream. On the flip side, when most comments were civil, readers rated the site more highly, even if the nasty comments appeared first. This is an important consideration for news organisations trying to determine how to deal with comment problems. So how do you tackle a comment problem? Some news organisations turn off comments altogether but this may not suit everyone. The comment section is important in creating a space where readers can engage with the story and discuss community issues. Another method of tackling the problem is to try and set a positive tone by having the journalist post the first comment. While this practice may be useful, it is not enough to offset the effect of uncivil comments. At the end of the day, what matters most is the overall tone of the stream. News organisations need to focus on the comment section as a whole. By not addressing the problem, your entire news brand could take a hit.